Apidra is designed for a rapid action release. When a medical care provider prescribes this medication, more than likely they will also give the patient a longer acting insulin as well. A person could also use this medication with insulin pump therapy. This method will be discussed with an individual’s doctor for the best course of action for an individual. This type of medication is created for an individual with type 1 as well as type 2 diabetes. An individual should take this medication about 15 minutes before a meal to ensure that the glucose levels are controlled. There have been extensive studies on the Apidra insulin. Adults with both forms of diabetes were watched to a great extent for a 26-week period. They were also watched for a period of 12-weeks in addition with the use of an insulin pump. The findings were incredible. The blood sugar levels decreased as time moved forward. The insulin pump assisted in individuals that did not desire to mix two medications together. However, the affects of the Apidra insulin was similar to the regular human insulin. It is important to use this medication as directed. If an insulin pump is required, follow all the procedures that are presented. When mixing two types of insulin, be aware of all the steps to complete this process safely. An individual should never mix two different types of insulin without the consent of a doctor. A person could harm themselves if the correct medicine is not taken. 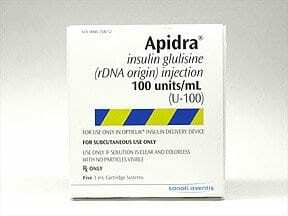 The Apidra insulin can be administered through an injection under the skin, in a vein or through an insulin pump. An individual’s medical care provider will explain how to accomplish each goal effectively. When a person opens the box, an inspection should be done. The Apidra insulin should appear colorless and clear. If it is not or particles are apparent, discard and open another container. Do no freeze the insulin and store in a cool refrigerator away from a light source. When an individual injects themselves with this insulin, the location should be different each time. A person can develop thickness of the skin or bumps. When using an insulin pump, it is suggested that the location is changed every 2 days. An individual may be able to use their needles more than once when they have the proper equipment. A person can find out more of this information through their doctor’s office. A person is prescribed certain doses for their lifestyle needs. Do not change this dose without first discussing this matter with an individual’s physician. There are several reasons why a person may need to change their medication. An alteration in diet and exercise can be a cause for this matter. An individual that is taking specific medication may need to discuss different doses. Several styles of over-the-counter pills could interact with the prescription; even vitamins can give an adverse affect. When an individual has different medical needs to take care of like dental or a hospital visit, the personnel needs to be aware of a person’s diabetic condition. Side effects can happen to anybody. Even though these are rare, a person needs to be aware of them. Allergic reactions can be at the injection site or display inside an individual’s body. System reaction may require medical attention immediately. When an individual is experiencing a large rash that seems to be getting bigger, difficulty in breathing or a rapid heart rate, theses could all be signs of system trouble. If this is occurring, seek medical assistance right away. Redness, swelling or itching at the injection location may be mild. Switch injection locations and continue to watch the symptoms. If they persist, contact the doctor. Low potassium is another side effect that may turn serious. It is important to ask the physician about this matter if it continues to be a problem.